Today I made a tag using the new "Floral Sentiments" set along w/one of the beautiful flower dies! You can always pick up some leaves from your local craft store! I also used the little background stamp that was in the set we sneaked yesterday called "Bloom Where You are Planted" ! I just LOVE how my tag turned out!!! 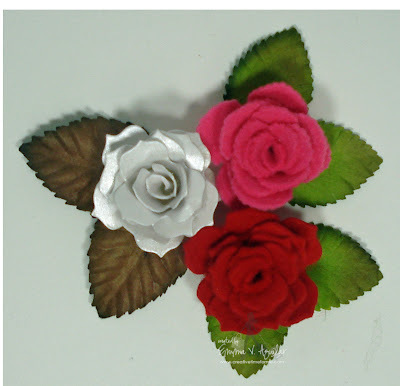 This picture below is how you can cut some pretty flowers out using felt! This is how the white flower looked after I misted it using water to help fold down the petals! I used water because the cardstock was on the thick side! Just add some leaves from your local craft store. I show you in my video below EXACTLY how I made the pink & white flower! Here is my video showing how I made the 3 flowers above! With all of our Sneak Peek weeks, I LOVE to do FUN giveaways! I will have random.org help me pick the winners & I will announce all winners on Thursday, April 19th during the Stamp Release Blog Hop happening @ 12:01am PST in my video! GOOD LUCK! Wow, I'm first. Love the flower die Emma, great project as aways. Emma! Your tag is beautiful! Love the flowers made with your flower die. You and your DT have outdone yourselves! WOW! The Design Team has out-done themselves. ALL these projects are fabulous and I just have to get one of these flower dies. Wow, wow, wow!! I am so in love with these dies!! I was happy to see that you came out with a rolled flower die Miss Emma! You rock!!! Can't wait to see the entire release, looks like it's gonna be a good one. The flower die is amazing! Can't wait to see what tomorrow holds. Oh how beautiful these all are-I am loving your sneak peaks!! Love the tag and the new die and sentiment, very pretty!! DT did an amazing job!! Can't wait for tomorrow to see the full sets and the surprise die!! How Pretty! I just did the hop and I’m so impressed with this release. I can’t wait to see tomorrow other die and big hop. Thanks for the video on how to use the felt. I too like the Raspberry fizz by PTI! TFS AJ! What a beautiful tag and I am so so so loving this die!! I am super excited for release day tomorrow! Everyone did such an amazing job all week! Thanks for all the inspiration!! This soon to be release is just so beautiful! Your DT has done an awesome job to truly present the sneak peeks! Very nice! WOW WOW WOW, I just love that flower die. All the projects are beyond beautiful. Gorgeous tag Emma!!!! The flower die is absolutely fantastic. They are really the prettiest die flowers I've seen....a definite must have for this crafter!!!! And I loved that you showed the felt...fantastic!!! Your DT has really done amazing projects this week!!! Thank you so much!!! Oh MY!!! These are JUST beautiful!!! I LOVE all of the projects. What a "sneak" peek!!! I feel so inspired after viewing these cards. I'm going straight to my craft room. Thanks! I am so IN LOVE with this Die and I cannot wait till Friday. So Gorgeous. OMGOSH! Your tag is gorgeous! AND eeeee! Flower dies! Love love love! Emms you out did yourself AGAIN! I LOVE all the new stamps and dies! I cannot wait until tomorrow! Have a wonderful day! Emma ~ Oh my word! That tag is soooo ELEGANT and BEAUTIFUL! I just LOVW how you added the ribbon on the bottom, the green ribbon and the twine bow! Just the PERFECT otuches! I don't have to tell you how much I LOVE the flower! Wait until others get their crafty hands on this die! It is so easy, quick and incredibly AWESOME to work with! They are going to LOVE the size of these stamps too ~ they just work BEAUTIFULLY with the dies! TU for coming out with this AWESOME release! Holy smokes Emma love the new die! I can not wait to get this release! Love your tag and flowers! Thank you for the great video showing various was to the flower die. Fantastic sneak peeks! Such a pretty tag! The flower die is wonderful, and so are your new stamp sets. I'm really enjoying seeing everyone's creations from this new release. Oh my word!! ABSOLUTELY GORGEOUS!!!! I can't wait to get my hands on this whole release. Also can't wait to see the new die. Love your dies-looking forward to the new ones coming out! These are just FABULOUS Can't wait for tomorrow. What a difference a Flower makes. Everyone's projects are awesome. Oh Emma I am really excited about this particular release and I really can't wait to get that flower die! Wow! That tag just sparkles. I love all the details..colors, flowers, sentiments. Great tag! I like the sentiment and the flowers are gorgeous. WOW! I can't wait to get the flower die! Looks like a fabulous release! I love that gorgeous flower die and can hardly wait to see more with that! Love the flower die, adorable! TFS. Your tag is beautiful! Can't wait to get the flower die! WOW! Emma you rocked that flower die! I love how the felt flowers turned out too! They are perfect! Thanks for all your awesomeness!! And the DT did fabulous as well! Wow, how do you keep coming up with these great ideas??? You are amazingly talented! Keep up the good work. Absolutely beautiful tag Emma!! I love how the die can cut other materials....must try the felt. So loving everyone's projects. Another awesome "sneak peek"!! Great dies!! Can't wait until this release goes live tomorrow!!! Great job Emma! I love these dies and the DT's projects are amazing and of course yours are Fabulous!!! I love these sentiments. I like how the main word is so whimsical with the more straight lettering of the rest of the sentiment. OMGoodness!!!!! !I am in LOVE with this release. WOW!! You all have OUTDID yourselves. I am amazed at how fabulous all the projects are. I LOVE LOVE LOVE the idea of bigger sentiments!! Wowza! Love the font on these sentiments and the flowers are amazing! You rocked it with this release! Just adorable! Oh Emma, I can't tell you how excited I am about your flowers!!! I just started playing with some flowers on my cricut & cameo, but to think that I don't have to use those & I can just pull out my cuttlebug makes me super duper happy!!! Beautiful flowers & sentiments, I hope I'm able to make a purchase this release! Very pretty flowers! The sentiments are BEAUTIFUL! Oh my! The flower die is amazing. I am going to have to break down and get a cuttlebug or big shot so I can order this die. Your creativity is inspiring. Thanks! OH my, this is my favorite!!! eeeeek I can't wait!!!! Absolutely amazing projects by all the DT. Love your tag and cannot wait until tomorrow to see the entire release and place an order!!! The die-cut flowers are fantastic. Thank you for the great video. The projects from the CT are all beautiful. Great work. I am looking forward to this Rolled Flower Dies. Wow!! Emma this flower die is Amazing!! I must have it!! Beautiful projects everyone!! Lovely flower die. Thanks for the video demo. looks easy when you make the flowers. Your tag is gorgeous. I love the sentiment. Can't wait until tomorrow. Wow, love all the flowers. Your DT is so wonderfully talented. Great job everyone. And this post is absolutely "jaw dropping." Beautiful projects by everyone...love all of them!! All I can say is "Want, Want, Want! " I can not wait to see your other die and to order these!! They are beautiful! I love the sentiment also. Wow, beautiful tag, love all the details and especially the flower. The DT has outdone themselves once again. I have inspiration overload and I love it! I simply love your project and the new flower die!! To the person whose name is missing on the card ~ Absolutely beautiful. The colors are so pretty. I love the new dies, two of them, how great. The flowers are soooo pretty.....I can't wait until tomorrow morning. I love everyones cards. The flowers are beautiful. I love that flower die. Can't wait to see more. You out did yourself with this die. Such beautiful flowers, even I could do that. I love this so much I posted to Facebook. Fabulous dies! Love love love them! You and your design team rock! Great products = great projects = great hop! This is a Gorgeous gorgeous release so far. Would love to win this. Thank you for sharing. Such wonderful projects!! I can't wait to see the release! This flower die is amazing. Love the flowers. OMG! Emma your flower die is "to die for"
I want one badly, can it be payday already?? Amazing flowers Emma!!! they are adorable!! Your tag is so chic, love it to pieces ;) Again wonderful job from your DT. TFS another great sneak peek and for the chance to win. There is one beautiful project without a link. I love your tag Emma and I know I will love this new die and the stamps. The whole release is awesome and I can't wait to get my hands on them all. I have shared on facebook. Wow, these are all so beautiful! I shared on FB! Honestly, how do you continually create such wonderful products? I always want everything you've released, but I have to be realistic. (tisk, tisk) Loving everything so far. So many beautiful projects. Your new die is absolutely fabulous. This will make making flowers so easy now. You're a genius! Emma you flower tag is beautiful & your design team's projects are so amazing!! I love the new stamps and dies! You've done it again!! Can't wait to get my hands on these dies. The designer hermes birkin kelly handbags are among the most popular handbags which can be bought in bulks at reduced rates. Most of the cheap louis vuitton handbags outlets sell wholesale designer handbags at attractive price rates with a wide variety of omega watches for sale, buying them at wholesale rates is an excellent idea to obtain some of the best best christmas gifts collections.